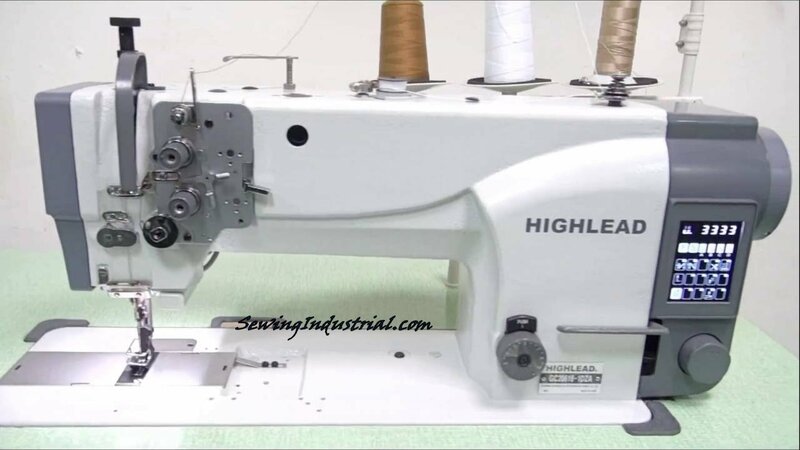 Highlead GC20618-1DZA direct drive heavy duty walking foot industrial sewing machine with vertical axis large hook, automatic thread trimmer and production aids. The machine is equipped with an automatic thread trimmer which is mounted under the needle plate for quick & accurate cutting of thread at the end of a sewing cycle. This saves considerable time when compared with manual cutting of threads using scissors. The thread trimmer is electronically controlled and uses electric impulse solenoids to activate the cutting knives. A newly developed Direct Drive high-torque motor system offers improvements* including: quick start and stop, accurate positioning, low noise, little vibration, smooth acceleration and a greater feeling of responsiveness for the operator. With Direct Drive power is transmitted directly from the motor to the drive shaft of the sewing machine, reducing power usage by up-to 40%*. Highlead Direct Drive also eliminates the need for a motor drive belt (connecting conventional table mounted motors to the sewing machine head) offering improved safety with no exposed belts or additional belt guards. The sewing arm is 30% longer* allowing additional sewing clearance, to the right of the needle, for larger heavy items. The application of needle bearings for the arm+hook shafts and an automatic oil lubrication system combines to make the GC20618-1DZA quiet, smooth running and durable. It features a safety clutch assembly which is fitted to help reduce hook damage should the machine become jammed. Needle position is controlled by an electronic direct drive needle position servo motor & controller. This will automatically put the needle in an UP or DOWN position at the end of a sewing cycle: reducing the need to use the manual hand wheel. The Highlead GC20618-1DZA is a feature packed heavy duty sewing machine and as well as direct drive, triple feeding system (bottom feed, needle feed & walking foot) and automatic thread trimming; it comes equipped as standard with programmable auto back-tack, auto reverse, knuckle quick reverse, auto air driven foot lifter, built in push-button control panel and LED needle area light. Example applications: medium to heavy weight materials such as car seats, sofas, upholstery, leather articles, belts, canvas, tents, awnings, handbags, webbing, outdoor wear, camping goods and other technical textiles.